This picture is small but all of the characters look fantastic. We have seen Wildcat and Flash previously, but Hawkman, Dr. Mid-Nite, and Hourman all look great in the bold (no pun intended) style of the show. I do find it a little amusing that Hawkman is actually a little less barrel-chested here than he was on Justice League! Definitely one to look forward to, along with appearances coming up from the Doom Patrol and the Metal Men as well! 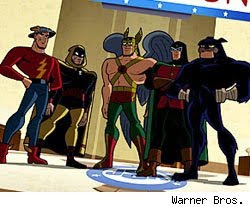 Image: Justice Society of America from Batman: The Brave And The Bold, 2009, image acquired from TV Squad. We've only got one comic in stores today, but I have a sneaking suspicion that the Hawks may pop up in it. Blackest Night #6 -- Things took a turn for the worse, if you can believe that, last time out, with Nekron turning all of the heroes who had come back from the dead -- including Superman and Wonder Woman -- into Black Lanterns. And supposedly things get even more grim for the DCU in this issue. This series has been a ton of gruesome fun so far, and I don't see it letting up any time soon. Even the spectre of a skip month can't dampen my enthusiasm for it. Summary: While Shiera is on an archeological expedition in Mongolia, Carter Hall just happens to hear on the radio that they have gone missing. So, Hawkman wings off to Asia Minor to track them down, wielding the ancient Sword of Keft. The expedition had been attacked by raiders, and all but Shiera were slain; the girl was instead taken captive and held hostage in Dravidia. When Hawkman arrives brandishing the sword, the Dravidians believe him to be Icaro, their winged god, taken form on Earth. Hawkman is welcomed by King Targo, and Shiera is set free. One of the Dravidians who raided the expedition, Daki, issues a challenge to Hawkman, but he is easily bested. Hawkman spares his life. Daki claims humility, but secretly plots a rebellion to overthrow Targo. His plans are dashed by Hawkman, who finally does him in, leaving Targo to rule his people in peace. Review: Definitely a lesser story, but with some novel elements. The use of the ancient sword to make the locals think that Hawkman was their god is one of these nice touches, which makes this more than just the typical "Hawkman in an exotic locale" story. What is odd though is that no mention is made of the fact that, even though the Dravidians welcome Hawkman and set Shiera free, they still killed the rest of the party! Oh well! 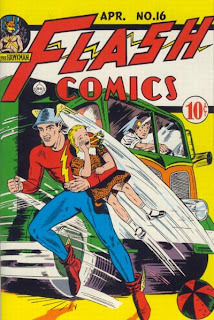 Image: Flash Comics #16, 1941, Harold Wilson Sharp. So, will there be any Hawk-related stuff at your local comic shops before the holiday? Let's find out. Blackest Night #1 (4th Printing) -- For those of you who came in late. I mean, really late. I mean, like missed homeroom and first period and now it's halfway through second late. The fact that this is at it's fourth printing clearly demonstrates that interest in this series has not waned for the general comics populace. Blackest Night: JSA #1 -- I am not sure if the Hawks will show up in this miniseries or not, but considering their ties to the Justice Society (both old and new), it would not be a stretch if they did. Word of mouth on the Blackest Night tie-in minis has been very strong across the board, so I am intrigued with this one. Green Lantern #49 -- When the Blackest Night goes, the reanimated corpses of Carter Hall, Kendra Saunders, Prince Khufu, and Princess Chay-era may follow. Very somber sort of stuff right before Christmas, but thems the breaks. From PopFunk, purveyors of fine DC Comics related t-shirts, comes this new Justice League headshot style shirt, featuring the Winged Wonder Hawkman. We've also got Supes, Bats, Aquaman, Plas, "That Goateed Moron" Green Arrow, GL, Flash, and... Robin? 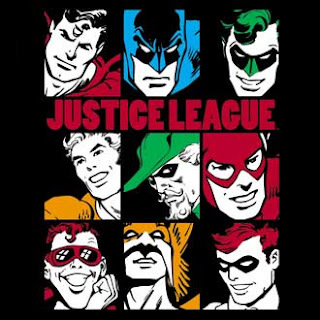 There's none of the legendary JLA gals on there but Robin makes the cut? Them's the breaks I suppose! Anyways, a nice, art-deco sort of aesthetic on this shirt, with the single color pops for each character, set on a black background. Another winner from the folks over at PF. Image: Pop Funk "Nine Blocks Of Justice" t-shirt detail, 2009, image retrieved from Pop Funk. Summary: After the events of last issue, Synnar the Demiurge and Deacon Dark are in command of the cloaked Thanagarian fleet over Rann, and have somehow established a fortified base on the surface. Not only that, but they have established a forcefield around the planet which prevents also communication and teleportation. But, Adam Strange, Hawkman, and The Weird receive backup in the form of Comet, Starman, Animal Man, Bizarro, Tigorr, and Starfire since Comet can still use his teleport powers. But things get even worse when Sardath informs the heroes that Lady Styx's armada is en route now as well! Needing intel, Adam has Comet telepathically spy on Synnar. Up on the ritual ziggurat erected earlier, Synnar tells Deacon Dark of how he came to be: Before time and space existed, The Supreme One created the Demiurge to be the architect of His universe. And he created the celestial, the mortal, and everything in between. Done with his work, the Demiurge watched over his creation while the Supreme One took care of His business, including the creation of the angels... and their eventual casting out. Angry at his work being cast aside by the Supreme One, the Demiurge began to reabsorb his creation into himself and build power. This lead to the only possible outcome, as all of the Supreme One's wrath and creations were targetted at the Demiurge. Afterwards, the Demiurge's very existance was striken from history, dubbing him "The Nameless" for all eternity. But, the Demiurge played gambit and survived, existing on a subatomic level to avoid detection. And over the span of all time, he slowly built himself up, from crystalline lifeforms, to organics, to sentient life, to other dimensions, and cybernetic networks. Eventually deciding to create a personification of himself, the Demiurge took cosmic dictator Tarus Deltar and transformed him into Synnar. But the plan unraveled thanks to the Justice League, and it has taken nearly two decades to get back to this point, with Synnar The Demiurge ready to spread his word throughout the universe. With Deacon Dark caught up, Synnar kicks Comet out of his head, having known he was being spied on the entire time. And with Comet busy spying, Bizarro is free to attack the Inquisitor robots. Synnar, however, is unimpressed, and effortlessly blasts Bizarro with an eye beam. With their heavy hitter down, the heroes are desperate, and running out of options. Review: And here is where the whole purpose of this miniseries comes to bear, as Starlin lays his latest cosmic heavy out on the table for us to peruse. And what a heavy he is: the Demiurge from the Age of Plato, God's Architect, building himself up into a force strong enough to overthrow God Himself. I'm sorry but that's freaking awesome. 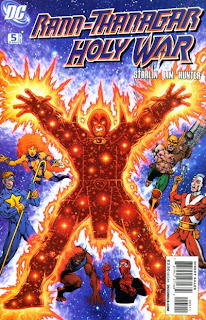 Synnar The Demiurge is one of the best villian concepts I have heard in a long time, right up there with Geoff Johns' take on the Reverse-Flash, and light years better than overhyped junk characters like The Hood. 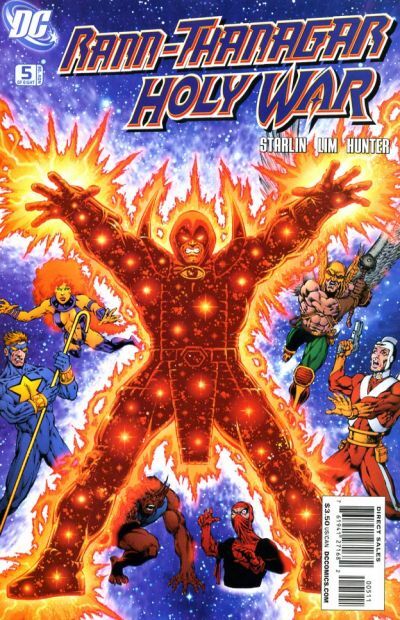 And while Synnar may have started out as a Thanos clone, adding this element of the Demiurge to mix transforms him into a unique celestial threat who should be on the level of folks like Mongul and Darkseid. Of course, DC won't use him like that, but if only Starlin uses him, maybe that's for the best. The rest of the issue is chess board manuvering, necessary but not the focus. Starlin is clearly in his element and enjoying himself playing in the cosmic sandbox. Image: Rann-Thanagar Holy War #6, 2008, Jim Starlin. Attention, attention! Awesome toy alert! Black Lantern Hawkman is coming from DC Direct! And that's not all! I hear rumblings of Black Lantern Hawkgirl coming soon as well! Oh man, between these two, Larfleeze, Indigo-1, and all of the other Black Lanterns, this toy line is getting out of hand with the coolness! Image: DC Direct Black Lantern Hawkman toy, 2009, image retrieved from Toy Legion. Doesn't look like much in the way of Hawkman related stuff out this week at your local comic shops, but we do have some things of interest. DC Holiday Special 2009 -- I have been a fan of these since DC restarted them a few years back. The Holiday ones are consistantly better than the Halloween ones -- maybe because sweet is more fun to read than horror when it comes to superheroes? In any event, this should be a seasonally fun comic, and worth the hefty price tag. JLA Year One -- This new printing of the Mark Waid penned series is a good way for fans like yours truly who missed out on it the first time to check it out. I have heard good things about this story, so I may have to pick this up. Ulises Farinas, artist of the webcomic MOTRO, has concocted this deviously awesome image of the Blackest Night -- as fought by Lego Minipeople! And who's right there, ready to lay a serious brick-kicking down but Black Lantern Hawkman! Notice also the Phantom Stranger standing off by his own in the back, Star Sapphire's costume looking even more ridiculous than normal, and Krypto! 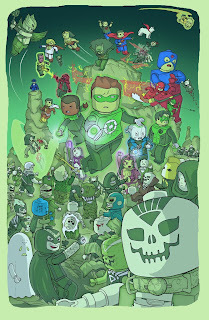 Image: Lego Blackest Night, 2009, Ulises Farinas, image obtained from IO9. What kind of Hawk-centric merchandise can one expect to find at their local comic shops this week? Let's find out. Rann-Thanagar Holy War v.2 -- Appropriate that I posted the review of #5 this week, as the second and concluding collection of this series is released. I have a weird sort of obsession with this storyline and it's sequel, in no small part to the issues collected in this volume. Issue #6, which details the history of the Demiurge, was one of my favorite comics of 2008, and introduced the most insanely awesome new badguy in superhero comics since Johns' created the new Zoom. Unfortunately, Jim Starlin is no Geoff Johns nowadays, so it seems that Synnar the Demiurge will remain toiling in obscurity. Still, plenty of Hawkman and friends action for your enjoyment in this book. From Justice League: Cry For Justice #5, we see that James Robinson knows who the real pals in the League are: Hawkman and The Atom! The word balloon in the first panel is misplaced, marring the image slightly, but I really liked this exchange. A lot of folks online have nothing but venom for this series, but so far I have enjoyed it (full disclosure: I have not read all of #5 yet). It certainly has gotten me interested in seeing what else Robinson is working on in the DCU, from Mon-El over in Superman to his run on the main JLoA title. Oh man, but do I dig Mauro Cascioli's art! I dug it on Trials of Shazam and I am digging it on Cry For Justice. It'll never happen, but how cool would a regular monthly JLA book by him be?! Image: Hawkman and The Atom, Justice League: Cry For Justice #5, 2009, Mauro Cascioli. Title: "Cursed Be The Peacemakers!" 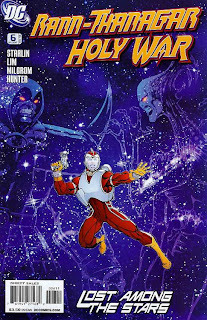 Summary: Comet, Adam Strange, Weird, Bizarro, and Starman return to Rann from the devastated Throneworld, and Adam wonders if he will become the target of Prince Gavyn's wrath. Meanwhile, Sardath and the Grand Mor of Thanagar are each planning an escalation of conflict, readying their fleets for combat. Hearing of this, Adam and Hawkman break out their "secret weapon," and split the team up, taking Comet and Bizarro with them out into space. The "secret weapon" turns out to be a telepathic wave broadcaster, a device which will use Comet's telepathy to speak to every member of both fleets! Despite discovering that the Thanagarians have extremely advanced cloaking technology, Comet is able to use the device to suggest that each of the fleet's respective gods has ordered them not to fight. Meanwhile, Deacon Dark and Synnar have made their way to Rann, where the "second coming" of the Nameless is set to take place. Placing a ziggurat in the middle of a desert, Dark begins the ritual while Adam, Hawkman, and Weird take a closer look. No sooner are they spying on the ceremony than they realize that Thanagar has snuck a cloaked fleet into low orbit around Rann! Deacon Dark tells Synnar that he is blessed to give the Nameless his name, and the cunning Synnar makes a power play, giving the name "Synnar." But this backfires on him, as the Namless is born into Synnar's body, which is changed to resemble the dark, armored form he wore in Hawkman and Adam's respective visions. Review: This is one of those issues where a lot of stuff happens, but it seems like not a lot of stuff happens. Does that make sense? Sort of anti-decompression taken to it's ultimate level. We have enough material here for two issues, but the fact that the Thanagarians have an invisible space armada just doesn't seem to have the weight that it should, and instead we focus more on the second half of the issue and the rise of the Demiurge. In any event, beyond suffering from being a middle chapter, this is a pretty good little comic, with some good character moments from the three leads, some nice pencils from Lim, and the plot moves along a good bit. And, of course, I am a sucker for Synnar the Demiurge. But it really does suggest to me that Starlin wanted 12 issues, got 10, and made due. Image: Rann-Thanagar Holy War #5, 2008, Jim Starlin.